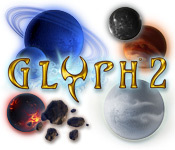 Glyph 2 is a match-3 game set in the alien world of Kuros, a place of elemental magic and bizarre buildings. 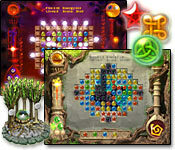 The fantasy artwork for the game world is colourful and creative. As shadow engulfs the distant world of Kuros, an Exile trained in the forces of light and dark is called upon to harness the elemental forces of Wood, Fire, Water, Metal and Aether and unleash the mysterious powers they hold. Walk with the Exile and help her uncover the ancient Glyph Energy, buried deep below the surface of Kuros, and drive back the dangerous shadow elements that are destroying this once beautiful planet. Utilize seven forceful mouse gestures to unleash level-altering power-ups and gather energy to use in the all-new world-development feature. Customize the surface of Kuros by rebuilding long-lost ancient structures which contain unique game enhancements. Help the Exile fulfill her destiny -- Restore Kuros to its former glory. Glyph 2 is waiting for you to uncover its many secrets. Continue your adventure from a first-person perspective in the hidden object adventure game Kuros.